President Trump this week pushed back hard against a new book that portrays him as volatile, semi-literate, and mentally unstable, dismissing the account as “fiction,” threatening the publisher with legal action, and slamming former White House chief strategist Steve Bannon as a “leaker” who “lost his mind” when “he lost his job.” Written by journalist Michael Wolff, Fire and Fury portrays a dysfunctional White House filled with warring factions, with Trump’s despairing staff openly questioning his fitness for the presidency. (See Talking Points.) After an excerpt was published last week, Trump’s lawyers issued publisher Henry Holt a cease-and-desist letter, threatening to sue for libel and demanding that publication be halted. Dismissing the request as “flagrantly unconstitutional,” Henry Holt published the book four days early. Trump dismissed concerns over his mental health, tweeting that he was “like, really smart” and a “very stable genius,” and promised to take a “strong look” at libel laws, saying it was a “disgrace” such a book could be published. Fire and Fury’s release precipitated a dramatic fall from grace for Bannon. He was quoted in the book describing a 2016 Trump Tower meeting involving Donald Trump Jr. and Kremlin-linked officials as “treasonous”; mocking Ivanka Trump as “dumb as a brick”; and warning that special counsel Robert Mueller’s investigation would be like a “Category 5” hurricane for the White House. Bannon claimed he had been misunderstood, and asserted his “unwavering” support for the president. But White House officials said there was no way back for the former strategist, whom Trump derisively labeled “Sloppy Steve.” The billionaire Mercer family publicly cut ties with the former Goldman Sachs executive, and this week he was ousted as executive chairman of Breitbart News, the race-baiting website that enabled his political rise. The media has portrayed Trump’s risible effort to stop Fire and Fury being published as a “Defcon 1 level threat to the survival of the republic,” said The Wall Street Journal. It’s nothing of the sort. Legal threats are a “long-standing Trump tactic” to intimidate journalists who say things he doesn’t like. But courts only block books from being published if they “violate national security,” and lawyers could never prove that Wolff intentionally lied about the president—the legal standard for libeling a public figure. Hillary Clinton, who wanted to “rewrite the First Amendment” to undo the Citizens United Supreme Court ruling on campaign contributions, “posed a far more dangerous threat to free speech” than Trump does. 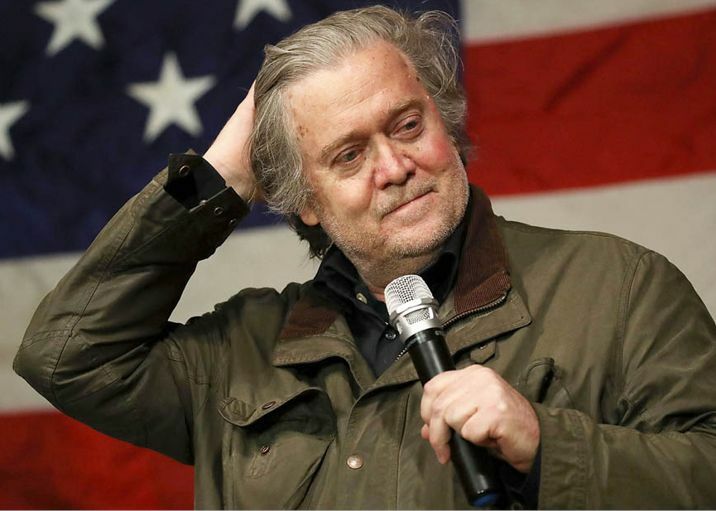 Good riddance, Mr. Bannon, said Rich Lowry in NationalReview​.com. A “flagrant self-promoter” who built his brand on being “the ultimate Trumpist,” the Breitbart firebrand never had the political know-how or popular support to realize his nationalist vision. Having now been “kicked to the curb” by the very man whose values he claimed to represent, Bannon is like “a parish priest who has been roundly denounced by the pope.” Bannon is finished. Nonetheless, Bannon told the truth about Trump, said Jonathan Chait in NYMag.com. The president is “unbalanced,” a “man-child” driven by primitive needs and impulses, and “guilty of a wide array of misdeeds.” But that’s a truth Republicans are completely unwilling to acknowledge. So Bannon’s “swift excommunication” removes the “last vestige of conflict between party and president.” Trump has joined the Republican establishment, which in turn now embraces and defends him.